The use of parachutes was an innovative method of warfare during World War II. This gave the Allied an opportunity to deploy the troops behind enemy lines. The first parachute jump pioneered the way for future jumps and also marked the birth of new airborne forces, that might play a vital role in military future. The U.S. Army conducted the first combat parachute jumps in November 1942: the soldiers of the 2nd Battalion 509th Parachute Infantry made a total of 93 combat jumps. These and other other soldiers formed the legendary 11th, 13th, 17th, 82nd and 101st Airborne Divisions, that participated in many fights during World War II and other military conflicts after its end. Regarding the importance of the first successful parachute jump, President of the USA George W. Bush created National Airborne Day in 2001. 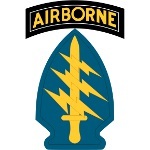 In 2009 Senate recognized National Airborne Day with Senate Resolution.